I am throughly enjoying being here! Today I walked all around the Easton-like area that our hotel sits in for about 2 hours - alone. I LOVED it so much - relaxing - no talking - no agenda - no deadline - no one knew who I was and it was wonderful! Being here is all about being unknown - one of many - one of 3,000 in attendance at this conference. Realizing how hungry I am to learn, to meet others that could become on-going new friends who toil in common ministry settings every weekend as we do. They understand the privilege of being away surrounded by people of like experience and responsibility. Tomorrow bright and early it all begins! 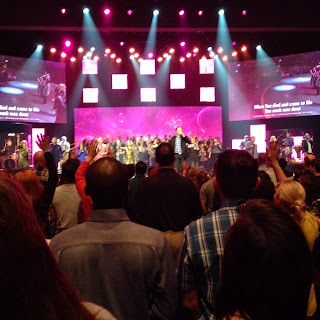 Today though, we got to worship at the Gateway Church and afterward talked to the keyboardist that came to Crossroads when Gateway lead us at the Night of Worship. We were blessed by a pastor from Egypt teaching the morning message. He spoke of the opportunity the Christians just had in their country as the Muslim Brotherhood burned churches and Christians' houses. He spoke about how their Christian testimony attracted the attention of the muslims who were not radical and they actually surrounded the Christian churches to physically protect them. The Christian leaders asked them to go home and save themselves! They told them the churches were only buildings - not worth them losing their lives. Muslims are coming to know the Lord as a result of the uprising that has recently happened in Egypt. He was amazing to listen to! Afterward, we talked to one of the pastors and found out he was from Detroit! We enjoyed talking to him about how he got to Gateway. Coming to this conference is as much about 'who' we get to meet and talk to as it is about attending the workshops and conference main sessions. Here are some of the shots from today. Somehow Milo got on the stage! Faces washed, stomachs full - good-night my friends!